Celebrate the great occasions in life with this explosion of colour! The Michelle features a kaleidoscopic reverie of mixed stems and comes arranged in a large keepsake basket. With the lush green foliage as the canvas, our florists slowly add the featured flowers. 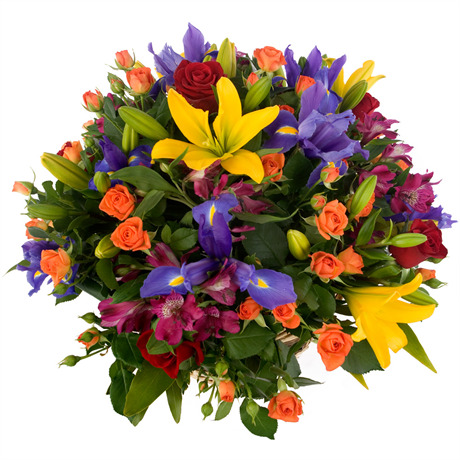 Peppered with apricot orange spray roses, acid yellow Asiatic lilies, magenta alstromeria, indigo irises and vivid ruby roses, this rainbow flowerscape is ideal for lavishing your affection on loved ones. Perfect for birthdays, romantic gestures, anniversaries, or as a get well gesture, the Michelle will astound your recipient with its fusion of colour and creativity. We recommend pairing this with a bottle of sparkling champagne or a box of delectable chocolates. Michelle with Card includes a premium card.